Daniel Strom definitely doesn’t do conventional! The watchmaker, designer and philosopher loves to play with contrasts, including in potentially disturbing ways. MEMENTO MORI, CARPE NOCTEM is no exception to this rule and the latest addition to the Agonium collection is sure to make its own impact. 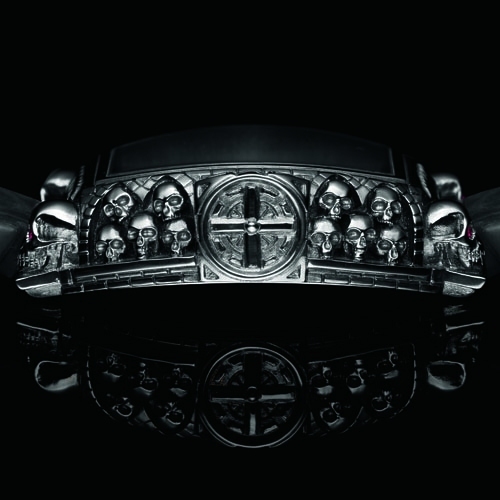 Behind its solid steel case adorned with skulls lies the same penchant for provocation. Behind its curves, incisions and cut-outs lies the same attention to detail. And behind the blood-red almost hypnotic appearance lies the ancestral Japanese art of Urushi. 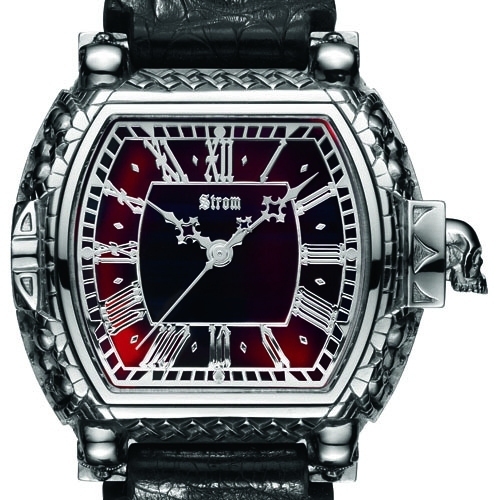 Strom sets the scene for this peerless lacquering technique and chooses Memento Mori, the first model in the Agonium collection, for this new interpretation. Carpe Diem thus becomes Carpe Noctem – “Remember that you will die. Seize the night”. The bone dial has given way to the red Urushi dial flirting with a shadowy shade of black. This intense vermilion hue is achieved by cinnabar pigments colouring this unique lacquer, formerly favoured for its durability and long-term stability but which quickly distinguished itself as an ornamental element. The watchmaker gives it pride of place by applying it to the dial, vividly echoed by the rubies encrusted in the eyes of the skulls taking their place on the crown and lugs, as well as the overstitching on the bright red strap. For a full three weeks, the master lacquer artist applies around twenty successive ultra-fine layers to form a result that is sturdy, fascinating… and always unique. This time-honoured art further enhances a timepiece that definitely never chooses the easy path. 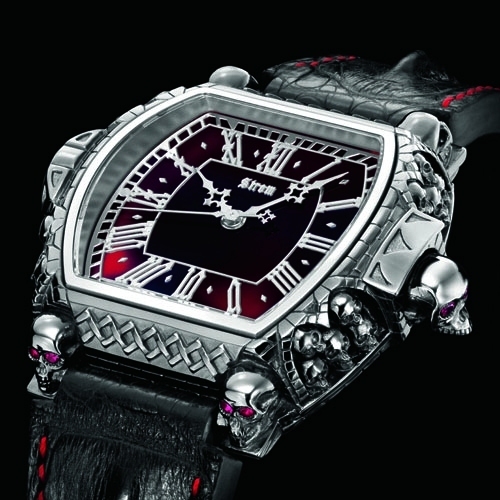 To begin with, the Philosopher adds his grain of salt by evoking our finite nature and invites us to enjoy life by adorning his timepiece with a highly symbolic face featuring skulls! The theme pervades the entire watch, from the case middle right the way through to the buckle, radiating self-evident provocation. Then comes the turn of the Watchmaker, with a solid silver case embodying a perfect match between horology and the silversmith’s art. The fascinating relief effects of the case middle sculpted by a master artisan house the ETA 2824 calibre. Finally, the Designer intervenes in the process. While remaining true to the original identity codes of the collection, he takes Memento Mori to the next level by associating traditional Swiss watchmaking with this Japanese art dating back over 10,000 years BC. It is quite clearly the respective contributions of these personalities that bring this daring vision to such singularly vibrant life. Bracelet: Black Hornback alligator leather with “skull” pin buckle in solid 925 silver, red overstitching, “skull” buckle in black rhodium-coated solid 925 silver, set with 2 rubies.